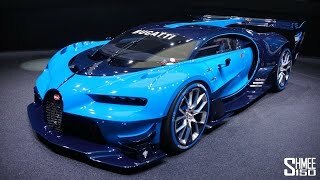 Unveiled at the Frankfurt Motor Show 2015 the all new Bugatti Vision Gran Turismo Concept 2015 might not look as extreme as the many other Gran Turismo vehicles but the power and looks are still not compromising at any stance. Taking the legacy ahead we presume that the Bugatti might have integrated some features and looks to compete with the excelling automotive market. 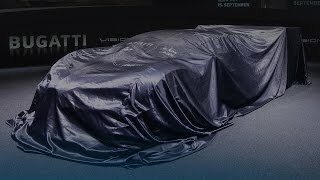 Let us have a quick descriptive look at the review of Bugatti Vision Gran Turismo Concept 2015 to know more about it. The interior of Bugatti Vision Gran Turismo Concept 2015 is totally race oriented; however comfort and luxury is nowhere left behind. The model comes equipped with bucket seats made from carbon-fiber and gives perfect grip over the multi-function steering wheel mounted over the dashboard. Over the classy dash you’ll also notice a high-resolution display featuring 1982 Tron arcade game footage. The interior is blended with curves all across especially noticeable are the one across center-console with exposed carbon-fiber spine and the center of the cabin and arcs into the ceiling. Also making the remarkable presence is the bespoke suede that covers most of the part. The material is the very same that can also be found on the high-end driving shoes for Formula One. The integration not only adds to looks but also lightens up the weight. Thus rounding up the interior details of Bugatti Vision Gran Turismo Concept 2015 has everything to enhance your virtual experience. 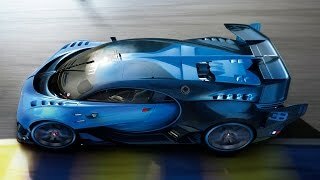 The exterior of Bugatti Vision Gran Turismo Concept 2015 comes drenched in the dual shades of French racing blue. The lighter shade covers the front section while the darker one dips the rear portion. Being more precise the color combination is very much similar to that we noticed earlier in Type 57G Tank of 1937 Le Mans-Winning. The front fascia comes adorned with the curvy body that we usually find in Bugatti cars and a massive air intake to deliver fresh air to the powerful system. Alongside are the aggressively designed four rectangular-shaped lights across the horseshoe grille. Moving towards the rear end the model is loaded with a massive LM P1-style rear wing. The open rear end gets more enhanced four central exhaust exits while the touch of modern and trendy comes with the LED light strip doing the taillights function. 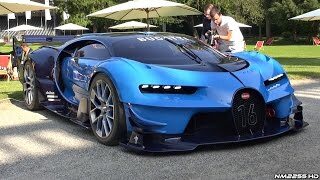 The performance figures of Bugatti Vision Gran Turismo Concept 2015 are not yet calculated but we do have the top speed of Bugatti Vision Gran Turismo Concept 2015, which the engineers have calculated to be at 250 mph. With this we can speculate the total output figures to touch somewhere around 1500 hp but still let us wait till the time company shares the final details.